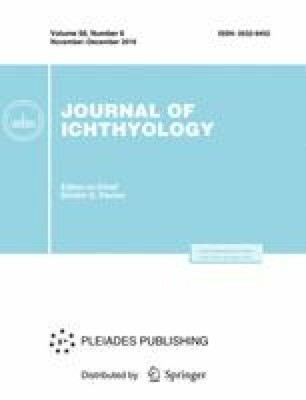 Two sympatric species of Siberian loaches are recorded in the Zavkhan River basin (Great Lakes Depression, Western Mongolia) and described as new for science: Barbatula conilobus and B. dsapchynensis spp. n. The former species, most likely, is widely distributed over the entire river basin, and the latter species, apparently, occurs locally, but in sympatry with B. conilobus. Morphological differences of the new species from other representatives of the genus Barbatula and their relationships are analyzed. Ecological distinctions between the species of the genera Barbatula and Triplophysa in the Zavkhan River basin are described. Possible mechanisms of development of the present fauna of loaches in Mongolia and adjacent territories with an appearance of sympatric species pairs in a single water basin are discussed. Original Russian Text © A.M. Prokofiev, 2016, published in Voprosy Ikhtiologii, 2016, Vol. 56, No. 6, pp. 655–669.